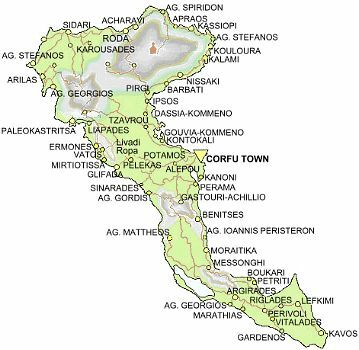 "I Corfu": that's what the little magnet on my home's fridge says. My son loves these little things, be they magnets from islands, from the shop just two blocks away from our house or from pizzerias. He just adores them, which is why the first thing I always buy when I go somewhere is a little magnet for him and the fridge. Of course, I used to buy them long before he was born (I like them too), but now I'm not even allowed to forget it. It's been seven years since I went to Corfu. It was with my wife and two of my best friends, Evelena and Chris. We spent two weeks there, even though we'd only planned to stay for one. That's how much we loved it! Anyway, before I start, I have to keep up with my plan, which says I have to get rid of the general information before I get into details. So, Corfu is the 2nd largest and most known island of the Ionian Pelago, it was named Corcyra in ancient times, after a mistress of the god of sea Poseidon and its Greek name is Kerkyra. 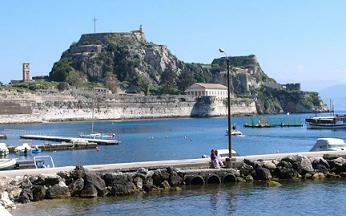 If you search for accommodation in Corfu I recommend you to visit Corfu Hotel Online Bookings. There, you can make your reservations directly to the hotels and find rooms in low prices and useful guest reviews. 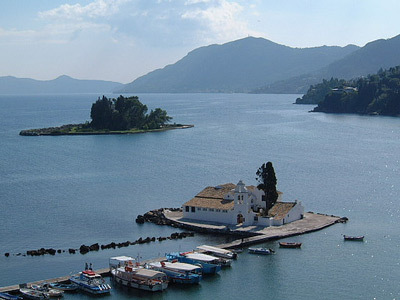 Why should you visit Corfu? I guess "because I liked it" is not a satisfying answer, huh? Well, OK. Here's the thing: Corfu is quite an attractive island. Actually, some of the Greeks and tourists consider it to be the most attractive Greek island. Homer himself once described Corfu as a "beautiful and rich land" and famous Shakespeare had it in mind when creating the magical isle of the Tempest. 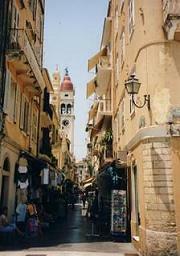 Corfu is architecturally special, besides its natural beauty. The periods it has been through, the Venetian, the English and the French, have changed it and shaped it making it what it is, with its castles, its kandounia (stone-flagged alleys) and its arcades. Its beaches are gorgeous (mind that even Chris, who never swims, did this time) and the places you can visit in Corfu are numerous: castles, museums, monasteries and palaces. Let alone Pontikonisi, the small beautiful island situated between Agriovotanos and Ellinika. Take the time to learn more about the "mouse island", as they call it, in my page Pontikonisi. So, now that we answered this question, let's move on. What does Corfu look like exactly? Well, I think I kind of already answered that. Its capital is merely Venetian, but the whole island is a combination of things. It's the greenest island of the Ionian Pelago, with lovely landscapes and beaches and lots of traditional Greek villages. Well. the past ten minutes I've been stuck in front of this question behind the screen, trying to decide how I'll start. It's not that Corfu doesn't have places. On the contrary, there's so many of them that I just can't choose where to begin. Should I start with the Esplanade? Perhaps. Besides, the Esplanade (or Spiniada) is one of the largest squares in Europe and one of the reasons why Corfu is such an attractive island. In the northern end of this mixture of park and town square is the Palace of Saint Michael and Saint George. 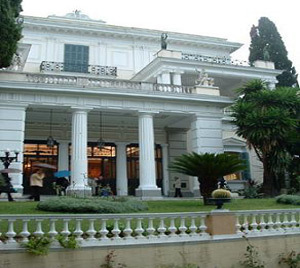 The Palace was built between 1819 and 1824 by the British and now houses the Museum of Asiatic Art, one of the largest and most significant privately formed collections in the world. If you like peculiarity though, a museum you should not miss is the Museum of Paper Money. This museum has banknotes from all over the world and Greek notes dating from the nation's birth. You can even learn how they're printed, since in one of the Museum's rooms the stages of the manufacturing process are demonstrated thoroughly. 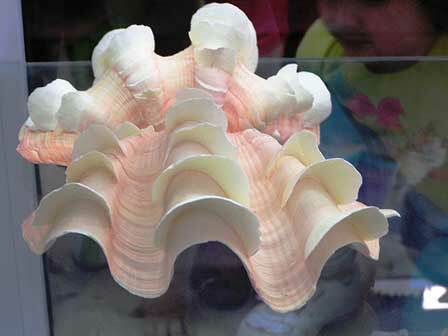 Another museum I personally enjoyed visiting is the Corfu Shell Museum in Benitses. This museum that has thousands of beautiful sea treasures is not only unique in Greece but also one of the best museums dedicated to shells and other sea treasures in Europe. Sponges, corals, starfish and fossils, a collection scientifically labeled, that's what you will find there, along with some unusual shells and souvenirs that you can buy. 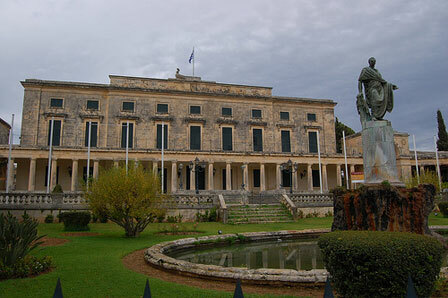 As for the Archaeological museum of Corfu, you can find it in the Garitsa Bay. Open since 1967, the Museum is the bay's main attraction, but not the only one. Its neoclassical mansions and the British cemetery with its intriguing headstones at the graves create a beautiful picture. The cemetery has actually become a natural botanic garden now, with rare species of wild flowers. Are you religious? Nevermind, don't answer that. Even if you're not, two monasteries of Corfu are worth your time. I'm not religious myself, but I actually enjoyed the visits. The first one is the Monastery of Platyteras that contains two beautiful icons given to Corfu by Catherine the Great in honour of Count Capodistria who is buried there and the other one is Zoodohos Pigi Monastery, which was built in 1228 on the site of a Byzantine fortress and offers a view to the sapphire sea below. The moment sightseeing tires you, I recommend you to pay a visit to Corfu Aqua-land. It is a huge water park 9 km west of town in Agios Ioannis. The best thing is that you only pay an entry ticket and then you can use any facility you want! It's pretty organized and you can see for yourself in this site how cool it is! Are there any historical or archaeological sites I can visit? This time I only spent a few seconds looking at the question. I couldn't decide if I should start with the two fortresses or the Achilleion, but I chose the forts. So, Corfu has two forts. obviously. The New Fortress was built after 1576 by the Venetians and why am I starting with it, instead of the Old one? Because I liked it more, actually. Yeah. Don't get me wrong, both fortresses are quite exquisite and special, but the New one just made me feel something from the moment I saw it. I just couldn't stop staring! Anyway, as I said, the New Fortress was built after 1576 by the Venetians and is a complex building with arcades and inaccessible tunnels, organized in two levels, the lower and the upper. There are two underground tunnels that you can explore and the views it offers are excellent. The Old Fortress, a result of many historical events such as the destruction of the Ancient City by the Goths and the fortification of the peaks on the rocky promontory, is bigger than the New Fortress and quite as impressive. You can wander around it and explore the Venetian tunnels and battlements it has, enjoy the views of the town that it offers and visit the church of Saint George that it houses. 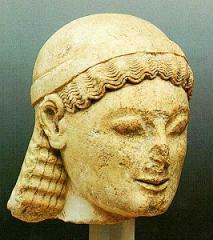 Now let me move on to the Corfu Achilleion. The Achilleion is a neoclassical villa that was built in 1890 by empress Elisabeth ('Sissi') of Austria after the death of her only son Rudolphe. The villa was named after her favourite hero from Homer's Iliad and she even placed a large marble statue of Dying Achilles at the garden. Ten years after she was murdered in 1898, the villa was bought by Kaiser Wilhelm who replaced the marble with a huge bronze, Victorious Achilles, with the inscription "to the Greatest of the Greeks from the Greatest of the Germans". Oh, you can find the villa in the village of Gastouri. Finally, there's the Doric temple of Artemis on Corfu island dating from 585 BC. The large altar and the retaining wall of the Hellenistic stoa still survive intact. 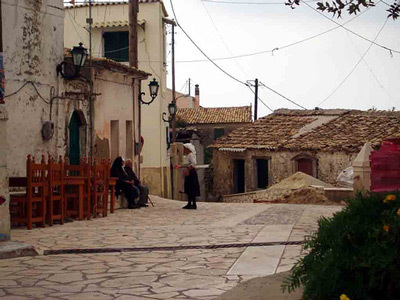 Corfu has many villages characterized as traditional by the Greek Ministry of Tourism. These places, Kalami, Kastellanoi, Kentroma, Kouramades, Kouloura, Lakones, Liapades, Marathias, Pelekas, Peroulades, Sinarades, Chlomos and the town of Corfu definitely worth a visit. For more information on how to go and what to see while visiting these fantastic locations visit my page Traditional Villages. Are there any beaches worth visiting on Corfu? As I already said above, most of the beaches in Corfu are so gorgeous that even my friend Chris took a swim. Of course, you don't know Chris so you can't understand exactly how strong this argument of mine is, so let me use words that will mean something to you: sand, pine trees, crystal-clear waters, green landscapes. Intrigued? 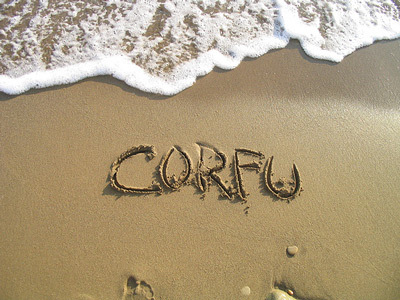 Learn more in my page Corfu Beaches. Corfu's cuisine was influenced mostly by Italy, due to the fact that it was never conquered by the Turks. Its specialties include foods like bourdeto, a spicy casserole of fish in tomato sauce and sofrito, which consists of beef, lamb or veal with garlic, parsley and vinegar. One of the places you should definitely try is To Dimarchio, on Plateia Dimarchiou. Greek, Italian and French dishes that are pricy but delicious and pasta and salad dishes that you will never forget, they're more than enough reasons to visit it. Then there's Arpi on Giotopoulou Street with its delicious crepes and the amazing sofrito I mentioned above. 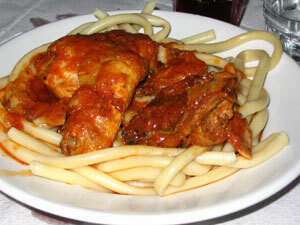 Mouragia on Arseniou Street has a great range of mezedes and local dishes like mousakas, plus grilled fish and meat. Rex on Kapodistria Street offers carefully prepared dishes like bourdeto, seafood and grilled meat. Just like most Greek islands, Corfu has a good nightlife. but don't expect it to be cheap as well. Places like Hippodrome, Apokalipsis, Au Bar and chain-bar Privilege are popular and worth a visit, but they're all going to cost you some money, i.e. a cover charge to get in and at least five euros per drink. But I don't mean to discourage you, if you're ready to pay or not drink a lot, you're going to have a great time. All of the clubs and bars are along Ethnikis Antistasis Street and while they mostly attract locals, holidaying Greeks and Italians, everyone's more than welcome and. who knows? You might find people from your country as well! How will I get to Corfu? Thankfully, Corfu has an airport with frequent flights from London and many other European cities. There are four flights per day from Athens and, while there is no bus linking the airport to the town, there is a regular bus stop on the main road and taxis that will cost you five euros. There are also ferries from many cities of Italy, like Venice, Ancona and Bari that will take from 8 to 28 hours, depending on the place you're coming from. Book online your ferry tickets to the greek islands and have them delivered at home easily.